Mayor Kasim Reed this morning is unveiling the city’s design for a 1,000-space, $48 million parking deck at Grant Park that will replace the space-wasting, seven-acre parking lot off Boulevard officials say is insufficient. The three-tier deck will be partially embedded into the hillside and—in a move that helped win support from the neighborhood and park advocates—capped by a green roof and a restaurant with views of the Downtown skyline in the distance. The announcement and detailed renderings come six months after City Hall first issued a request for proposals to design and build the deck. City officials have no set date to start construction but expect the project to wrap up in late 2018. The structure, which will double parking in the area, is designed to be largely hidden from people walking, biking, and driving along Boulevard. But yes, where parking in the current lot is free, the new deck will not be. Revenues from those parking fees will go to pay off the bonds that will help fund the deck’s construction. Dubbed the Grant Park Gateway Project, the idea for the deck started out simply enough, according to Amy Phuong, the city’s commissioner of parks and recreation: to beef up parking capacity at one of the city’s most popular parks and tourist destinations. 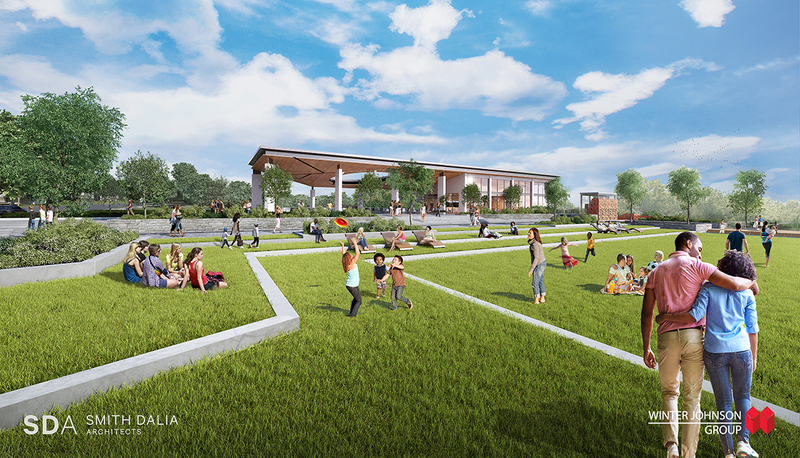 Judging by the renderings, lounge chairs will line the edge of the facility and border the terraced green roof where park-goers can gather and relax. Inside the deck will be an area for bicycle parking and a rainwater harvesting system to irrigate the greenspace. The deck will offer park visitors a new entryway into Grant Park and the zoo, turning a “hideous surface parking lot into a highly designed feature,” Phuong said. Gone will be the days, she said, when moms pushing strollers will have to navigate a downward slope on asphalt. The path spanning the deck’s entrance will stretch deeper into the park and toward a new plaza and the 96-year-old neoclassical building designed by Atlanta architect John Francis Downing that until recently hosted the Cyclorama. (The massive painting of the 1864 Battle of Atlanta is now at the Atlanta History Center as part of a $35 million restoration and relocation project.) The zoo, with the help of a $20 million matching grant from the Robert Woodruff Foundation, plans to turn the old Cyclorama building into a ballroom and events facility, complete with wall-to-ceiling windows and a patio overlooking an expanded area for elephants, giraffes, and other animals, plus administrative offices. 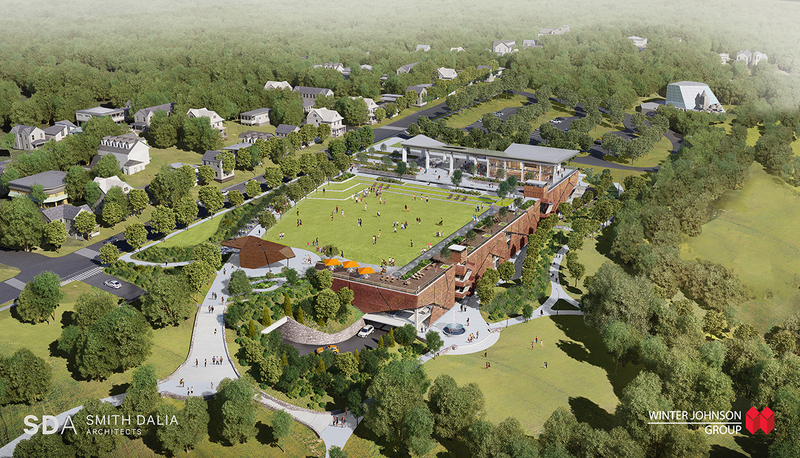 Grant Park finds itself in the middle of a southeast Atlanta development boom, with hundreds of millions of dollars in new housing and retail planned or underway in the surrounding area, along with the Atlanta Beltline on its southern border. Zoo Atlanta is projecting 1.2 million visitors by 2019, up from the nearly 1 million people it hosted last year. Officials expect a sizable chunk of those zoo patrons, plus other people who might be drawn to visit the park and the new facility into the future, to choose driving over taking the bus—at least until Beltline transit a few blocks away, or the streetcar, which could run along Georgia Avenue, becomes a reality. The Grant Park parking deck project has garnered nowhere near the controversy that sprung up in in the mid-2000s just a few miles to the north, when the Atlanta Botanical Garden, Piedmont Park Conservancy, and City Hall turned a chunk of Piedmont Park into a (mostly) underground parking deck. Though some Grant Park residents said they were frustrated with the city’s transparency early on in the planning efforts, voiced concerns about losing mature trees, and questioned the actual need, others are now pleased that the proposed facility does more than just serve as a place to park cars. Eric Schneider, who moved to Grant Park a few years ago, said he hopes the city takes the opportunity to build connectivity between the greenspace, the surrounding neighborhood, and other communities, and will “use this project as an anchor to develop a safer Boulevard,” the hectic thoroughfare that runs along the park’s edge and which will feed motorists into the new deck. A city spokeswoman says it is exploring options to do so. In all, says Michelle Blackmon of the Grant Park Conservancy, which worked with the neighborhood association to advise the city on the design, the facility could help more people access the park that Col. Lemuel P. Grant envisioned being a respite for urbanites when he gifted the land to the city in 1883. The fact that the project is tucked into the landscape and uses green infrastructure such as rainwater harvesting was critical to winning support. If the city proposed just dropping a box, she says, the welcome might not be so warm. As for that restaurant, no details yet on what chefs might be interested. Paging Kevin Gillespie?